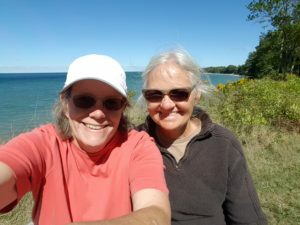 Hello, we are Linda and Kathy, partners-in-crime for more than 36 years! We have a great life together and have been blessed with many wonderful memories and a few sad ones as well. Living the typical American life style, we have raised a family and worked more than half of our lives. We have three great kids and four wonderful grand kids that are the best! Of course – we can’t forget to mention the three grand dogs as well! We love visiting and babysitting whenever we get the chance. The paths we have taken and the choices we have made have led us to where we are today. We are now both retired and loving every minute! The sense of freedom each new day brings is indescribable. Life at times seems too good to be true. We can do the things we have dreamed about for years. No more planning once a year vacations, no more living for the weekends… because now every day is like a vacation! The one common thread we have had consistently in our lives is camping. We started out backpacking in the early 80’s; then moved to tent camping and enjoyed many family camp trips together. We then graduated to a used Coleman pop-up tent camper which we enjoyed for many years. Then we softened a little and bought a 24 ft travel trailer, but overall it felt cumbersome so we downsized to a hard-sided pop up which we drove to Alaska and Nova Scotia. We had some great memories in the Chalet and were sad to see it go. In preparation for the extensive travels we have planned now that we are retired, we bought a 24 ft Phoenix Cruiser motor home and we think that will suit us just fine. We are looking forward to having some great adventures along the way. We love being outdoors, we love to travel and we love to play! Our hobbies are flying kites, blowing gigantic bubbles, paddle boarding, biking, hiking, exploring and traveling in our motor home. This blog will be a journal so we can chronicle our adventures as we create some wonderful memories. Memories that we can look back on and feel good about. We also want to keep in touch with our family and friends. We look forward to meeting other people who share the same interests and making new friends along the way. If you are reading this blog, we would love to hear from you. We hope you enjoy the blog and can give us some ideas on great places to visit. We welcome you to follow along as we discover some beautiful places in our travels.